Bellamy "The Hyena" is the captain of the crew and has a 55,000,000 Beli bounty. Bellamy earned his nickname from his trademark grin and his reputation for scavenging riches from other pirates, much like a hyena scavenges its food. 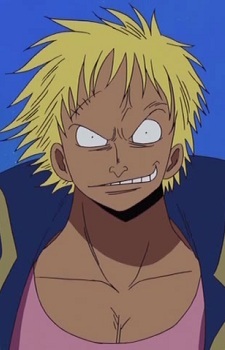 Bellamy's character is one that is arrogant, violent and vain, but significantly humbled when facing more powerful foes, as he revealed to Donquixote Doflamingo that he only engages in fights that he knows he can win. This later led to his defeat by Monkey D. Luffy, whom Bellamy thought was weak. Bellamy and his pirate crew play a significant role in the Jaya Arc of the series. After the end of the Skypiea arc, the true leader of the Bellamy Pirates, Donquixote Doflamingo travels to Jaya to kick Bellamy out of his crew and forces Sarquiss to attack and apparently kill him "as a lesson," for disgracing his flag. Appears is the newest One Piece arc (manga) chapter 706 confronting Luffy and telling him he won't laugh at him anymore.